dBX series mufflers – this Laminar Flow internal configuration muffler features the revolutionary HP core design delivering excellent sound control for a wide variety of engine types where vehicle under-chassis space is limited. 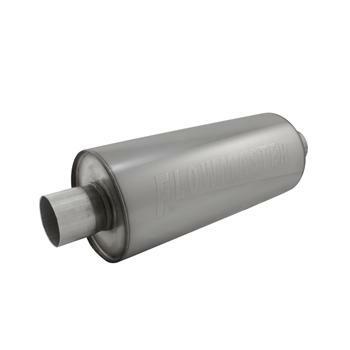 Utilizing cool shell technology to minimize radiant heat from the muffler body, they are perfect for sport compact imports as well as muscle cars and other performance applications. Constructed with 409S stainless steel internal components and wrapped with a proprietary insulation material and finally a polishable 304 stainless steel casing, these mufflers are as attractive as they are functional delivering a moderate to aggressive tone.